The origins of the name Tallaght are lost in legend. It s said that the Partholonians, the earliest invaders of Ireland, who settled in the plain between the hills and the sea, were later wiped out by plague, and were buried in the district. Hence it became known as ‘the plague-memorial of the people of Partholoin, or in Irish, ‘Támhleacht muintire Partholóin’, a name later anglicised as Tallaght. Tallaght first enters history in the third quarter of the eighth century with the foundation of its monastery by Saint Maelruan. Maelruan was the outstanding figure of the 8th-century reform movement in Celtic monasticism, and Tallaght was its most important centre. We have no life of the saint, who died in 792, but he seems to have made a deep impression on the Irish Church of his time. He was the outstanding figure in the 8th-century reform of Celtic monasticism, and Tallaght was its most important centre. We have valuable information about the life of the monastery in the Rule, Penitential and Customs of Tallaght. Other valuable documents from this foundation are the Martyrology of Aengus, the Martyrology of Tallaght and the Stowe Missal. Three years after Maelruan’s death, the Vikings sacked the monastery of Lambay, and from that day forward one great foundation after another was pillaged and burned. Tallaght’s turn came in 811. Another monastery subsequently rose in its stead, but it was the end of the golden age of Gaelic monasticism. Tallaght survived as a rural bishopric down to 1152. The last mention of Saint Maelruan’s monastery is in 1125, and in 1179 Saint Laurence O’Toole, the last Irishman to be Archbishop of Dublin before the Reformation, received the grant of Tallaght, with all its possessions, to the See of Dublin, from Pope Alexander III during the Lateran Council. After the Norman invasion, Tallaght, like the See to which it belonged, passed into the hands of Foreign prelates, and it was to suffer in many an Irish raid on the Pale. 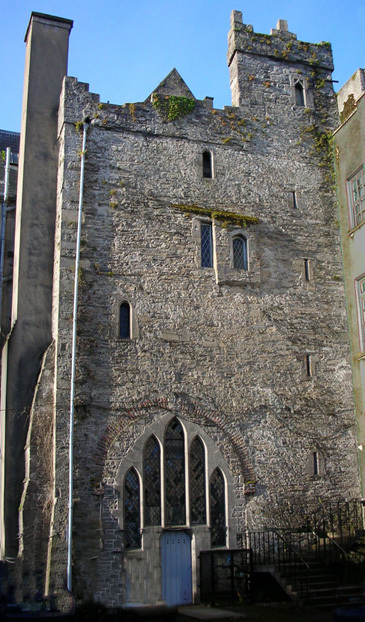 In 1310 the bailiffs of Tallaght obtained a royal charter to fortify their town with a wall, and fourteen years later Archbishop Alexander de Bykenore, who was also Justiciar (Viceroy) of Ireland, set about building a castle on the site of Maelruan’s monastery. Henceforth Tallaght Castle, with the neighbouring castles at Tymon and Drimnagh, was to be an important link in the line of forts defending the Pale.